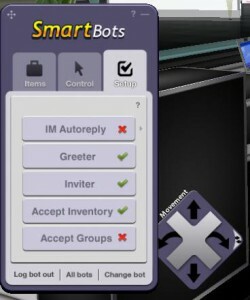 As you may already know, SmartBots HUD Device is a special tool to gain control over your Second Life bot remotely. It provides essential functions to control your personal bot: Upload items to bot inventory, Teleport bot to your location, Sit, Stand etc. There’s a new feature available with SmartBots HUD which allows moving your Second Life bot around with the movement tab. You are not limited to “Come to me” or “Teleport” functions anymore to place your bot at specific location. Movement panel provides you with several options: forward, backward and rotation controls. If you already purchased your personal Second Life bot with SmartBots, feel free to test out the new HUD yourself. 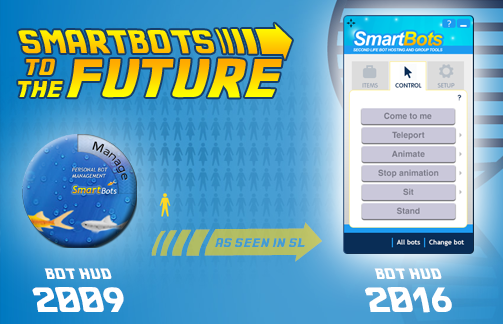 You can get a new SmartBots HUD at the SmartBots Office (take it from The Payment Terminal or Devices Storage). 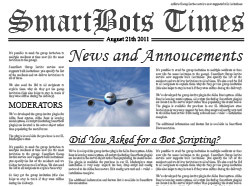 For more info check out a documentation page on SmartBots HUD.